June 18, 2011 by Alphageek in "alphageek", "cooking", "review"
The Alphageek arose early this morning. When one cannot sleep late on a Saturday morning, that leaves only one possible activity: a trip to the local Farmer's Market. 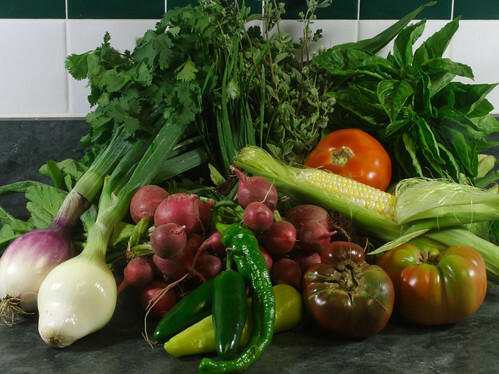 We are very fortunate to live only a few minutes away from our local market. We decided to head down, and see what is good. I want to take a second and thank Mrs. Alphageek for her help with the pictures. She took the time to help make these look good, instead of what I was going to do, which is pretty much dump the bounty on the counter and take a picture. Below is some great fruit. 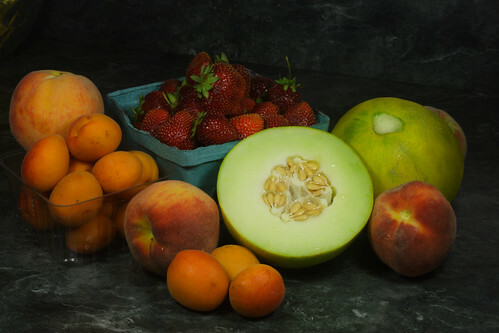 Almost all of the fruit came from the Westmoreland Berry Farm, which is usually a great choice to get prime fruit. They had a few stawberries left, and they excellent, without any concession for being picked late in the season. The smell of fresh peaches is what drew us over, and they did not disappoint. The big green fruit came from another stand, and the vendor we purchased it from called it an ambrosia fruit. It is sort of a taste between a melon and a cantaloupe. I think the ambrosia fruit may be something of an acquired taste. It is not bad, but the cross taste sort of surprises one when eating. What can I say about a pile of vegetables like the ones below, other than yum? At least I got to pick only what I like. I love radishes, and the farmer's market is a great place to get them because they have not been sitting with greens on for days. Those radish greens can rot pretty quickly. There are already some heirloom tomatoes. They were not the best looking I have ever seen, but I am sucker for the next great tomato. Once I saw the tomatoes and the peppers, I decided to make some salsa. We purchased some herbs for the salsa, as well as the onions. There is the first food adventure for today. I will try to remember to let you know how the salsa turns out. Consider this my endorsement of farmer's markets everywhere. They offer some great produce at reasonable prices.